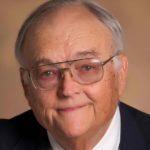 Our friend, mentor, and Pine Belt PRAM founding member William E. “Bud” Kirkpatrick died at his home on May 18, 2018. Beth Bunch of Signature Magazine wrote a beautiful obituary summing up the great accomplishments of Mr. Bud’s life. He will be tremendously missed. William Ellis “Bud” Kirkpatrick, 82, of Hattiesburg, MS, died May 18, 2018, at his home. Kirkpatrick established the first public relations office at The University of Southern Mississippi in 1972, where he served as director. In 1997, he was named Assistant to the President for University Relations and held this position until his retirement in 2002. Kirkpatrick holds the distinction of being the longest continuous serving employee in the history of the University, with 45 years of continuous service. Kirkpatrick most recently received a Forrest Health Spirit in Action Award, which is presented for an individual’s commitment to the community. Kirkpatrick committed his adult life to promoting the Pine Belt. Services were held May 22 at Parkway Heights United Methodist Church with burial in Lake Park Cemetery in Laurel. 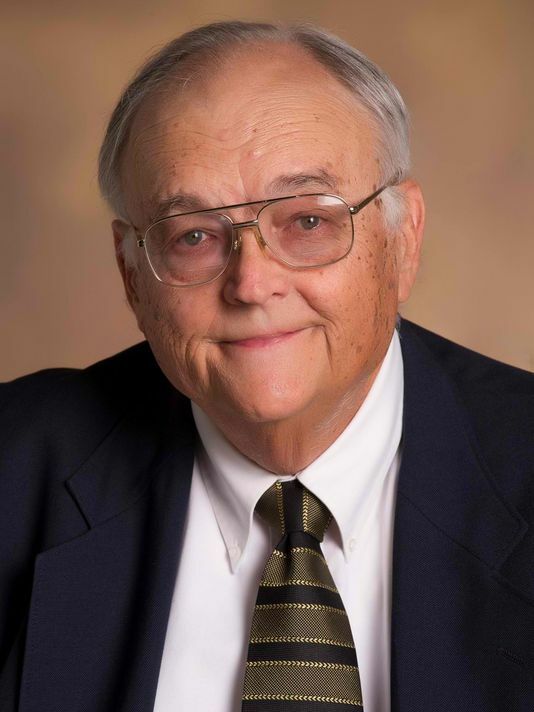 During his service he was eulogized by Rick Taylor, executive director of the Hattiesburg Convention Commission, of which Kirkpatrick was a member, and John Cox, the voice of the Golden Eagles, who was given his first job by Kirkpatrick. Kirkpatrick was born in Louisville, MS, attending school until the third grade when his family moved to Winnfield, La. He graduated from high school in Winnfield and attended Centenary College in Shreveport, La. He also received a diploma from Copiah-Lincoln Junior College. He attended Mississippi Southern College/USM, where he received a B.S. in Business Administration in 1958, and M.S. in Recreation in 1964. He became a student employee of the R. C. Cook University Union in 1957. Upon graduation in 1958, Kirkpatrick became Director of the University Union and Student Activities. He and Virginia LaVigne of Laurel met in 1957, and were married in 1959. Their first home was an apartment on the third floor of the Student Union Building. His tenure at USM allowed Kirkpatrick to create and serve organizations that benefitted both the university and students, including being the originator and director of the National Spirit and Sportsmanship Workshop and the National Collegiate Communicators Workshop, serving as the national advisor for Associated Student Governments of the United States, creating the University Photo Service at USM, and founding and editing the Collegiate Scene Magazine. In 1972, Kirkpatrick moved into a broader role, serving the USM community as the Director of Public Relations, where he created The Golden Eagle Sports Show for television and the Golden Eagle Radio Network. He created USM’s first basketball highlight television program, The M.K. Turk Show. He also developed, produced and directed USM’s first live football and basketball telecasts to a commercial television station. He also contributed greatly to the arts by creating Southern Exposure, a song and dance troupe, Pops-In-The-Pine Belt and Pops-By-the-Pier, which brought together the USM symphony, choral groups and the Jazz Lab Band to take USM beyond the campus. The Kirkpatricks became members of Parkway Heights United Methodist Church serving the youth and music programs, and many boards and commissions through the years. Kirkpatrick taught the Men’s Bible Class for 30 years. He also served as Communications Coordinator for the Mississippi Conference of the United Methodist Church. In 1995, when Oseola McCarty donated $150,000 to Southern Miss, Kirkpatrick managed the public relations and related activities of McCarty. This included her day-to-day activities, travel, public appearances and supervising the publication of two books. In preparation for the 1996 Olympics in Atlanta, Kirkpatrick developed the original local idea and concept for Olympic teams to conduct pre-Olympic training at Southern Miss. The project, which began in 1994, became a joint-venture with Rick Taylor, director, of the Hattiesburg Convention and Visitors Bureau, the City of Hattiesburg, Forrest County, and other sponsors. The teams from Kenya, Malawi and Equatorial Guinea, lived, trained and had their meals on campus and in Hattiesburg from June 15-July 15, 1996. Hattiesburg and USM received an international award from the Hospitality Sales and Marketing Association International in New York City for this pre-Olympic training project. Other recognition included two gold awards, one platinum award and the 1996 Edward L. Bernays “Best of Show” Award in the Golden Bell Public Relations Competition. Kirkpatrick most recently served on the Lake Terrace Convention Center Commission. Affectionately known as “Mr. Bud”or “Mr. K,” Kirkpatrick was a member of the Sales and Marketing Professionals of the Pine Belt and a founding member of the Public Relations of Mississippi-Pine Belt (PRAM) Chapter. He was given lifelong membership by the chapter (an honor not given to many). The Professional Achievement Award, which he was given in 1996, was later named in his honor and is awarded each year. The chapter also sponsored a room named in his honor in the mass communication building at Southern Miss. He also was a College Public Relations Association of Mississippi (CPRAM) member and the Public Relations Association of Mississippi and the Sales and Marketing Executives International of Hattiesburg and Laurel. At USM, awards and honors throughout the years included two outstanding staff awards, an outstanding service award, USM Alumni Association in 1992 and 1995, and induction in the Alumni Hall of Fame in 1995. He was honored with a scholarship in his name for USM Mass Communication and Journalism students. He was also a Charter Member of USM Legacy Circle, a USM Centennial event honoring all the people who have worked for USM 40 or more years. He was selected for the 2015 School of Mass Communication and Journalism Hall of Fame. During his 45-year professional career, Kirkpatrick received numerous local and national honors and accolades. Among those honors and awards are: Omicron Delta Kappa, National Leadership Honorary; Pi Tau Chi, National Religious Honorary; Who’s Who in South and Southwest; Resolution of Appreciation for serving as communications coordinator, Board of Trustees of State Supported Institutions of Higher Learning; Distinguished Salesman Award, Sales and Marketing Executives of Hattiesburg, 1974, 1997; “Who’s Who in Advertising,” 1992; “Who’s Who in Public Relations,” 1992; “Outstanding Service Award,” Tourism Volunteer of The Year for Hattiesburg, 1995; Quarter Century Award, Council for Advancement and Support of Higher Education (CASE), 1997; 1998 Innovation Award, for Test Drive A Degree at USM Gulf Coast; Hall of Fame – Sales and Marketing Executives International – Hattiesburg and Laurel – 2010; named to the Hall of Fame of the Southern Public Relations Federation (SPRF), composed of public relations organization in Mississippi, Louisiana, Alabama and Florida. Due to his leadership with the Hattiesburg Daylily Society, Hattiesburg recently garnered the nation’s first National Daylily City designation. Kirkpatrick worked tirelessly with other members on the annual Hemerocrallis Daylily Show held each June, as well as the Memorial Day weekend garden tours and monthly meetings. He was instrumental in having the daylily named as the official flower of Hattiesburg. In retirement, Kirkpatrick had a working philosophy that throughout his working years, the good Lord had taught him so much, or put him in the position to learn so much, he would only help with public relations and marketing for non-profits, at no cost, as a give-back project. Among these was the Edwards Street Fellowship Center, Historic Hattiesburg Downtown Association and FestivalSouth, to name a few. Kirkpatrick was a member of the Jolly Boys, a group of 15 friends that met every week for about the past seven years at The Front Porch – no agenda, no bylaws or officers. They celebrate birthdays and other life events, spend time with each other and solve the world’s problems. Survivors include his wife of 59 years, Virginia LaVigne Kirkpatrick of Hattiesburg; his children, David of Gulfport and Kathy of Hattiesburg; a son-in-law, John Bailey of Hattiesburg; two grandchildren, Heather Bailey and Jeremy (Rachel) Bailey. He was preceded in death by his parents, William Lee Kirkpatrick and Gussie Mae Ellis Kirkpatrick. Memorials may be made to the USM Foundation Bud Kirkpatrick Scholarship, Parkway Heights United Methodist Church Youth Fund or Edwards Street Fellowship. The family would like to express their appreciation to the following for their care: Dr. Hal Liddell, Dr. Bo Hrom, Neva Bounds, Ann Easley, Samantha Easley, Meagan Mixon, Forrest General Health, Merit Health Wesley, Forrest General Home Care & Hospice and Southern Grace Senior Home Care.